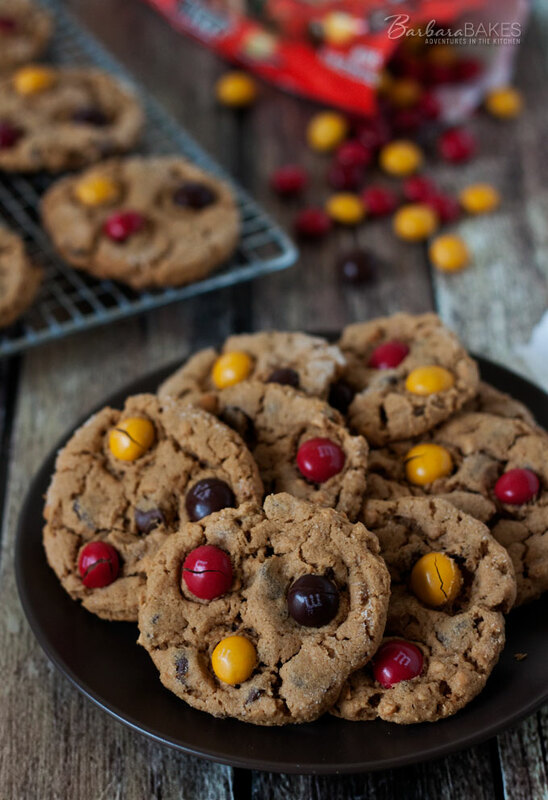 Flourless Peanut Butter Chocolate Chip Cookies studded with chocolate chips and dressed up for the season with fall colored peanut butter M&M’s on top. These gluten-free cookies are tender and chocolatey and without the flour, the peanut butter flavor shines through. My niece and I were talking about baking cookies for her wedding, and she said she wanted to include a gluten free cookie for family members that were eating gluten free. I suggested serving flourless peanut butter cookies. Ultimately she decided not to serve cookies, but I couldn’t get the flourless peanut butter cookies off my mind; everyone raves about how terrific they are. Everyone at my house agreed – they’re a tender, soft, delicious cookie. My son’s friend Mitch especially loved these cookies. He’s always complimentary about everything he eats at our house, but he said these cookies were the best cookies ever. In a large mixing bowl, mix peanut butter, brown sugar, egg, baking soda and vanilla until well combined. Stir in chocolate chips. Use a small cookie scoop, drop rounds 2 inches apart onto baking sheets lined with parchment paper. Use the bottom of a glass dipped in sugar to flatten the cookies slightly. Press several M&M’s in to the top of the cookies. Bake the cookies for 12 to 14 minutes until the tops are crinkled and before the edges begin to brown. Cool on sheets 5 minutes. Transfer to racks; cool completely before serving. I don’t know how I missed these but I found them when searching for peanut butter cookies. So cool to find yours. 🙂 I’m going to love these. These remind me of a peanut butter cookie I used to make called Hugs. Simple and yummy. I am totally obsessed with peanut butter at the moment Barbara so I might just have to try these! I love peanut butter cookies! 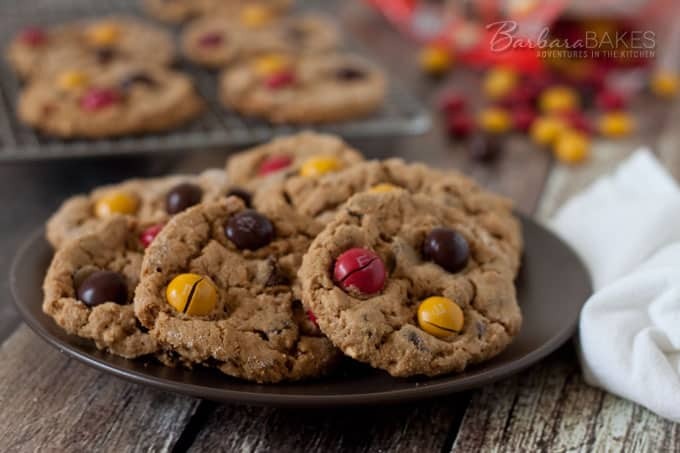 These look fabulous Barbara – pb m&m’s are my favourite too, so its like heaven to me! Your photos look great. I’ll have to try to make these good looking cookie soon. Now I can’t get these cookies off my head!! They look fantastic with PB M&Ms! Barbara, These look and sound wonderful. I’m always trying gluten free foods and these look scrumptious. I certainly will give them a try. Yummy!! Such a perfect looking cookie!